Can’t decide between something sweet, salty, or bitter? At Real Pickles you can have it all. Dan began making traditional pickles in 1999 after attending a workshop at the Northeast Organic Farming Association conference. He was excited about the benefits of locally grown food, and started pickling cabbage, turnips, greens, and other vegetables as a way to eat locally throughout the winter. After two years of traditional pickling, Dan decided to start a business and Real Pickles was born. The company is committed to promoting human and ecological health by providing delicious and nourishing food while working toward a regional, organic food system. Real Pickles exclusively buys their vegetables from family farms in the northeast and sells products locally. To top it off, all of their ingredients are organic. With the help of Addie Rose, Dan was able to grow the business to add products like organic sauerkraut and ginger carrots, expanding sales throughout the region. With growing sales, Real Pickles outgrew their location at the Western Massachusetts Processing Center and moved into an old industrial building. Abiding by their sustainability mission, they converted the building into a solar-powered, energy efficient, organic pickling facility. After the move, the company tripled its purchasing from local farms. 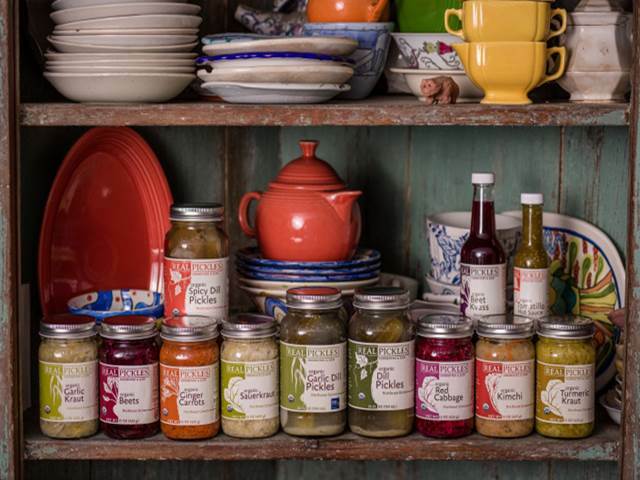 In its years as a successful pickling company, Real Pickles has demonstrated that there is a real and growing demand for raw, fermented vegetables all while maintaining a commitment to social responsibility. Starting in 2013, Real Pickles transitioned into a worker co-operative. Now ten workers own the company together, with shared investment in their fermented goods. You can find Real Pickles at the SoWa Farmer’s Market July 8, August 5, and September 9!